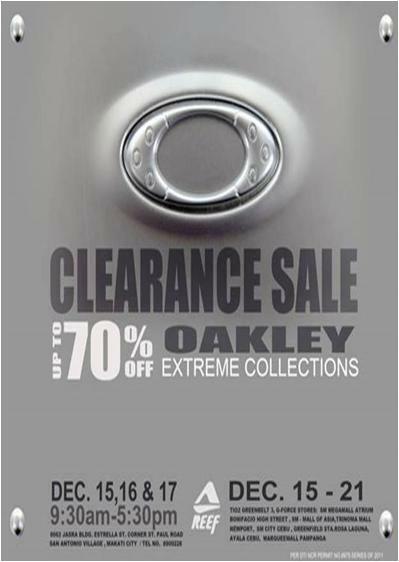 The Oakley Warehouse Sale is from December 15 to 17, 2011. Up to 70% off for all items which they call Extreme Collections. Sale Hours: 9:30am to 5:30pm. TiO2 Greenbelt 3 and G-Force Stores in SM Megamall, Bonifacio High Street, Mall of Asia, TriNoma, Newport, SM City Cebu, Greenfield Sta. Rosa, Ayala Cebu and Marquee Mall in Pampanga. Shoot I missed the 15-17 sched...How about 15-21. Oakley pa din? oh i missed such huge event. But it seems you are in need of a good warehousing services in the philippines. Thanks for sharing this.